Exchange Category Manager is a plug-in for Exchange server 2010, 2013, 2016 or office 365. Without any interaction to the user's pc or Outlook it enables you to manage categories and colors that are available to the users in Outlook by directly managing their Outlook master category list on the Exchange server. If you have more than a few Outlook users and they use color categories in shared and delegate (calendars, contacts or email) folders then this tool is for you. Only then you can be sure that, when one user selects a certain color for an item, all other users will see the same color. 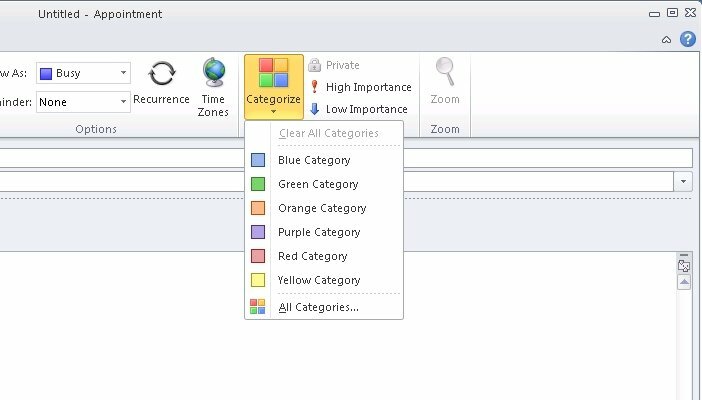 You can define an unlimited number of color category definition groups for different groups of users. Each group can have it's own set of categories and colors that the users can choose from in Outlook (pc or mac) or OWA. Per user group you can either add color categories to Outlook or replace all categories with the predefined list of categories and colors for that group. The plug-in is built with the Exchange Webservices API and can be installed on any windows computer that can connect to the Exchange server or office 365. It can safely run from the Exchange server itself too. The product is a spinn-off from Exchange Group Calendar where category management is essential to ensure uniformity in the public calendars. This is not an Outlook add-in so it does not have to be installed on every computer. The installation does not add or replace dll's on the server and does not use the registry. Uninstalling is a matter of deleting the install directory and nothing will be left on the server. Efficient Lady's Organizer is a cross-platform personal information manager specially designed for ladies! It has a fashionable and pretty interface - a choice only of happy and demanding ladies! And you can sync data across PC and mobile phone. AllMyNotes Organizer - an extraordinary random organizer! Save every bit of your sensible information safely hidden away from prying eyes. Thanks to this app saving ideas, memos, and storing passwords is a pure happiness.